The main feature of Kobe chair is the body, made of BAYDUR®, a rigid polyurethane material that guarantees excellent performance as regards resistance as well as being 100% recyclable and fireproof. The result is a functional and comfortable chair, thanks to the excellent flexibility of the back, which adapts to fit every type of posture. Seating system with shell in BAYDUR® in the finishes: white, light grey, anthracite, black. 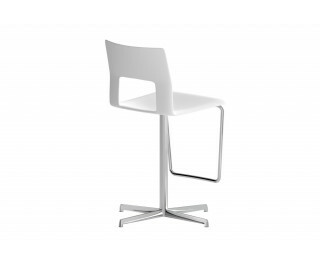 Version without armrests also available in eco-leather, leather, cowhide, cuoietto. Base: 4 steel tube legs (stackable) or 2 continuous legs (stackable) or swivelling base (not stackable).